The Surreal Reasons Girls Are Disappearing In El Salvador: #15Girls : Goats and Soda Refuse to share a pencil, reject a boy, say no to your imprisoned dad — all of these can get a teen girl killed in El Salvador's gang war. 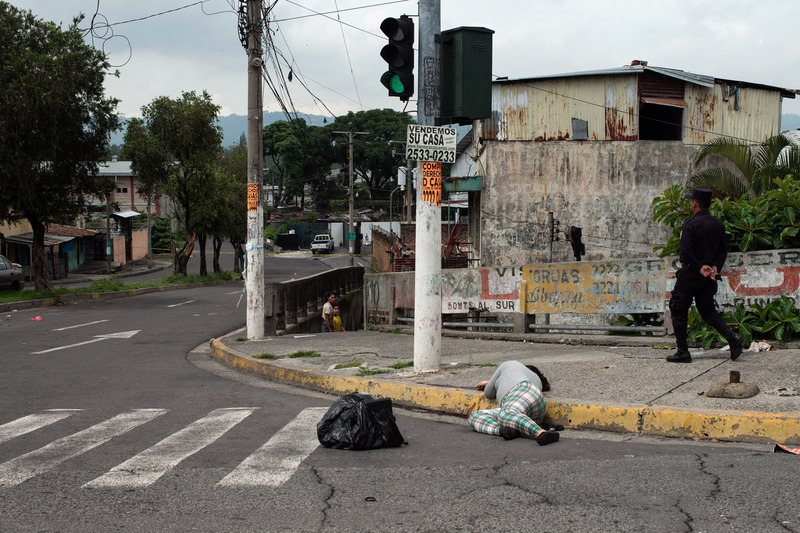 A girl looks away from the body of an assassinated man, who was killed by a gang member in San Salvador. In many countries, the decisions teens make at 15 can determine the rest of their lives. But, often, girls don't have much say — parents, culture and tradition decide for them. In a new series, #15Girls, NPR explores the lives of 15-year-old girls who are seeking to take control and change their fate. Warning: Some of the depictions and images in this story are graphic. It's our first morning in El Salvador's capital. We're eating breakfast and we get a call from a local reporter we know. There's a crime scene, he says. A girl. You should come. We take a taxi to what looks like a major intersection in San Salvador. When we get there, we look around. And then we see her, slumped on a street corner. Marcela, 15, was assassinated in San Salvador in July. She was walking with her sister when a man approached them and shot her twice in the head, killing her instantly. The girl is dead. She's 15 years old and her name is Marcela. Witnesses tell us she was executed by a gang member. We can't see her face. All we can see is her plaid pants and gray T-shirt. Her family is across the street in a pickup truck. We can't tell you their names because it would put them in danger. Marcela's mother is too upset to talk. So, we talk to her grandmother. She says Marcela left the house that morning with her sister. The two worked in downtown San Salvador, the capitol of El Salvador, making tortillas. The grandmother tells us that Marcela's boyfriend was a bus driver in a gang-controlled neighborhood. First, he got threats. "Help the gang or we'll kill you." Then he disappeared. 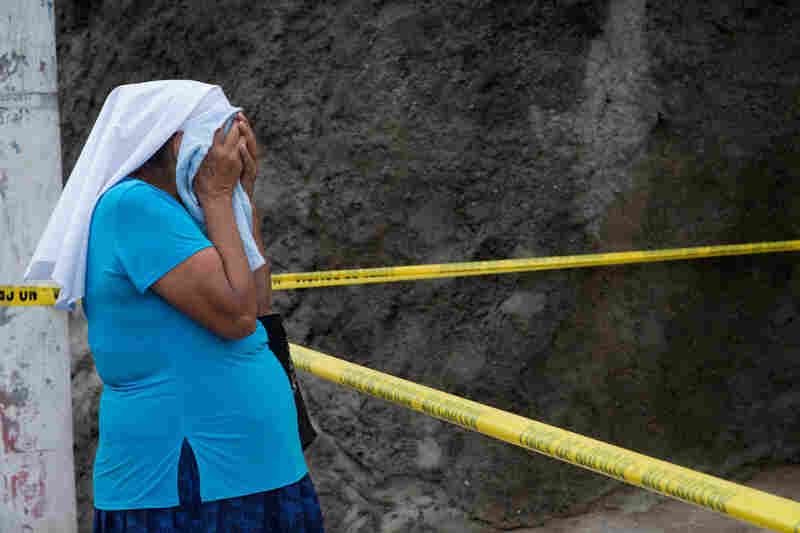 Marcela's grandmother cries at the scene of her granddaughter's death. Then Marcela started getting threats. And now this: Marcela's body, lying on the ground, while people drive to work. If you were standing at the U.S.-Mexico border two summers ago during the so-called "surge" of unaccompanied minors trying to come to the U.S., you would have seen thousands of young girls from El Salvador. If you had asked them why they came, they would have told you the answer is simple: gangs. Back in the 1980s, during El Salvador's civil war, many people migrated from El Salvador to the U.S. On the streets of cities like Los Angeles, they formed gangs. Then, many of them were deported back to El Salvador. And they brought the gangs with them. 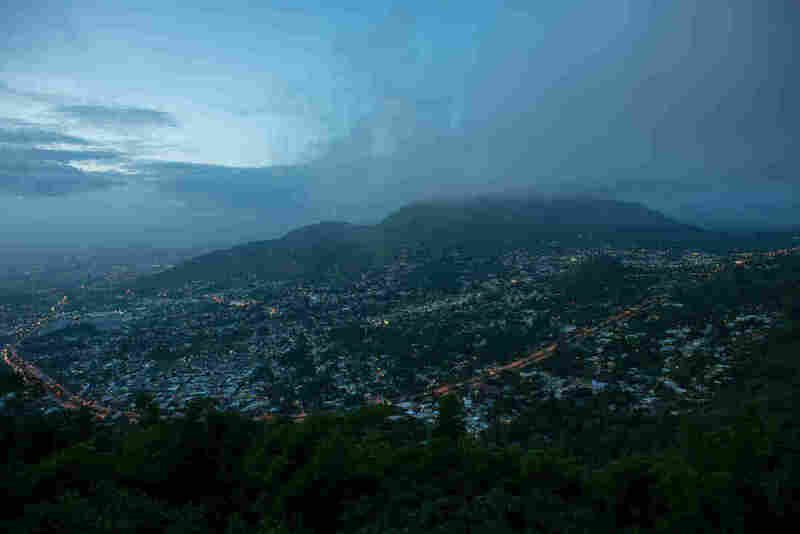 Now, El Salvador's two main gangs — Mara Salvatrucha (MS-13) and Barrio 18 — control much of the country. 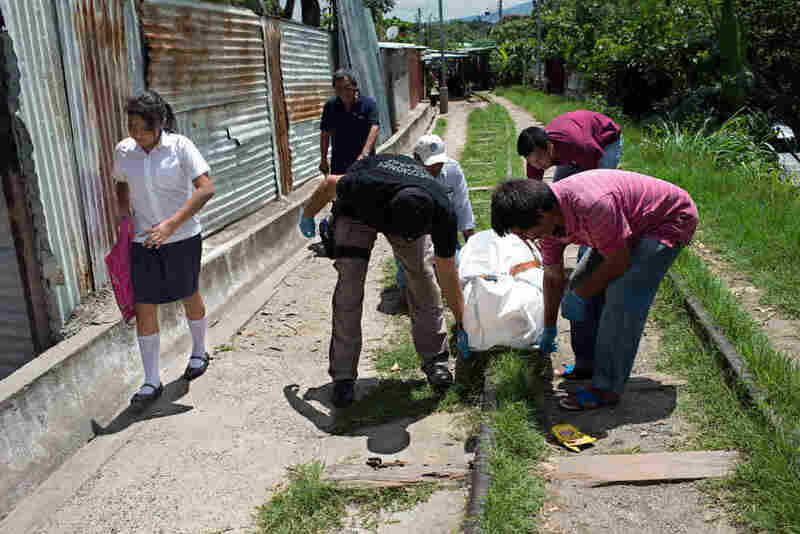 There is so much violence in El Salvador that someone dies there, on average, every hour. Much of the killing is over turf or revenge. And sometimes people are just caught in the middle. Many times, those caught in the middle are girls. We went to El Salvador to talk to these girls, to understand why they would want to make the perilous journey to the U.S., why they would ever want to leave home. This is the story of four of those girls. In most cases, we're not using last names; to bring any attention to them would make them a target of the gangs. We find the police investigator on the case. He says Marcela was attacked from behind and shot twice in the head. He says Marcela's sister witnessed the killing. She's now in police protection. We ask him why a gang member would kill a 15-year-old girl. He speculates that it's because she didn't want to be someone's girlfriend or didn't want to do something for that gang. Is this normal, we ask? Does it happen to young women a lot? It happens every day, he says. The police later release Marcela's sister from their protection, even though local reporters tell us the gangs will probably go after her now. The family tells us their only option is to leave the country, ideally for the U.S. But they've got about $200 to their name. It's not nearly enough to pay a smuggler. All this happened on our first full day in El Salvador. If this is how bad it is, how do girls live? To answer that question, we go to a school and start interviewing 15-year-old-girls. One girl stands out. Her name is Aby Salas and she wants to study law. She says her favorite thing is to sit down with some hot chocolate and a book. That and go to church. It was at church that Aby met her best friend, Jessica. Aby and Jessica used to go to school together. After Aby Salas' best friend disappeared, she stopped leaving her house except to go to school. Then another girl at school started threatening Jessica. "At first it was like a little game," Aby says. "If you don't give me this, you'll be in trouble." Give me that blouse, the girl would say to Jessica. Give me those jeans. "And it got to the point when she wanted help cheating on tests," Aby says. "And the threat was always like, 'We're going to be waiting for you outside of class, to beat you up.'" It might sound like pretty typical bullying. But this bully's brothers were in a gang. One day the girl asked Jessica for a pencil. Jessica only had one pencil, so she said no. A few days later, Jessica went to the store. "Her mom says she left at 3:30 in the afternoon, and then it was 4, and then it was 5, and this was a store that was right on the corner," Aby says. "And we haven't heard from her since." And now, ever since her best friend Jessica disappeared, Aby spends all her time at home. A few days after we meet her at the school, she shows us her room. It's about 8 feet by 8 feet, painted pink with cinder block walls. If she's not in school or helping with dinner, she's here. And it's her choice, she says. It's basically a self-imposed lockdown. After what happened, Aby's too afraid to go out. And her parents are cool with that. But her parents won't talk about what happened. They don't want to scare Aby's little brother and sister. "It's too dangerous to talk about that," she says. "If somebody hears you talk about it, something bad could happen to you." The family of Aby's best friend, Jessica, has moved away. They're hiding from the gang. They're planning to come to the U.S.
"Then I'll have nothing left of my friend, Aby says. "She'll just be in my head." After we meet Aby, we start asking people in El Salvador, "Is it normal for girls to shut themselves in the house all day?" Yes, they tell us. It's the only way to stay safe from the gangs. In other words, El Salvador is a country of girls with two main choices: Hide from gangs or give in to them. We do find an exception to that rule. Her name is Stephanie Noemi. Her friends call her Mimi. She's 15 years old. 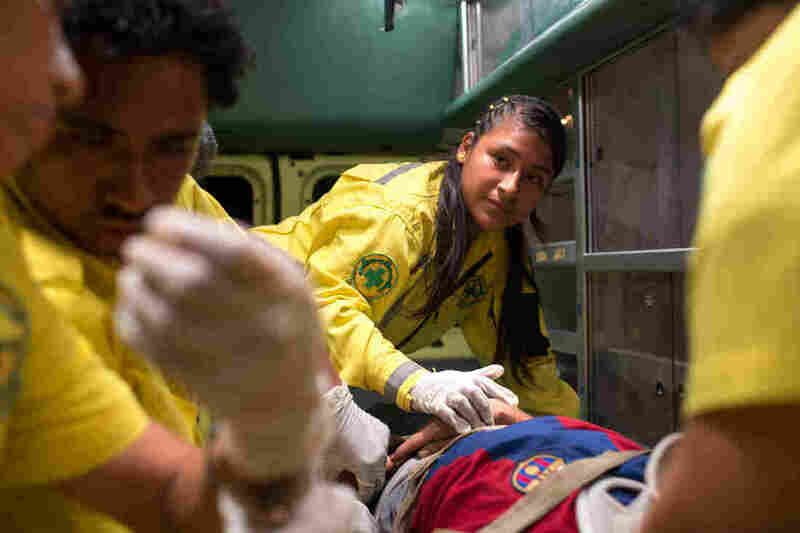 And instead of staying home on a Friday night, she puts on bright yellow coveralls, chants a prayer and starts the overnight shift as a volunteer ambulance worker with a group called the Comandos de Salvamento. Mimi joined the squad when she was 10. A relative suggested she try it. Now, she says, it's the only way to get out of the house but stay out of trouble. Her neighborhood is completely controlled by gangs. As a paramedic, she likes being able to help people who are victims of the gangs. Mimi, 15, volunteers at Comandos de Salvamento. She deals with all kinds of emergencies, extreme violence and people who have been severely injured or killed by the gangs in El Salvador. "It feels good to be somebody else's shield," she says. We spend the night shift with Mimi. We watch as she and her colleagues help a girl with special needs, who has spiked a fever, get to a hospital. We watch as they respond to a man who has been hit by a car and is now unconscious. And, toward the end of the shift, we watch as they confront El Salvador's gang violence up close. A woman stumbles into the Comandos headquarters, which is basically a garage for a handful of ambulances. One side of the woman's face is covered in blood and the men with her say she has been thrown from a bus by gang members. Her little boy's shirt is bloody, too. The Comandos bandage the woman and Mimi cleans the boy. Then she puts them both into an ambulance that will take them to the hospital. Mimi tells us she wants to stay in El Salvador. She says if she helps people like this, maybe someday someone will help her, too. 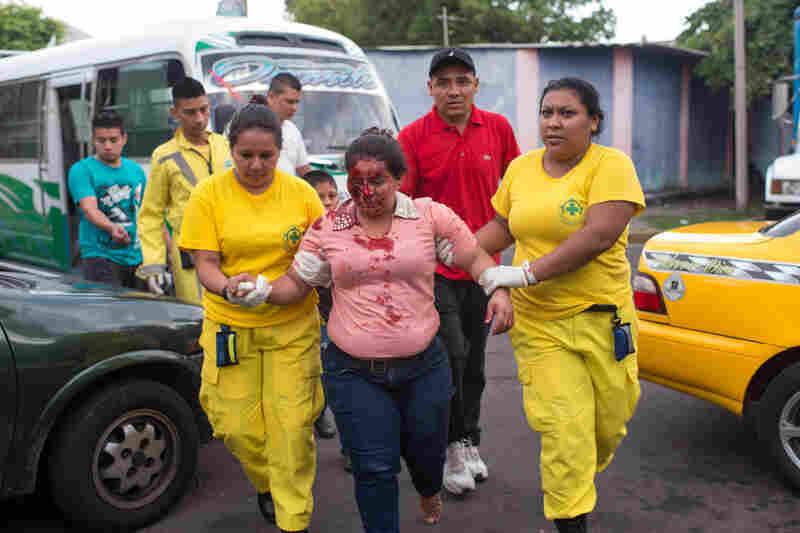 One reason we're not seeing a "surge" in unaccompanied minors coming to the U.S. from Central America is that Mexico is catching them before they even reach the U.S.
A wounded woman arrives at the offices of Comandos de Salvamento. Her companions claim she was pushed from a bus by gang members. If you're from El Salvador and you get caught, you end up in the deportation center in San Salvador. It's one of the last places we go in the capital city. And it's where we meet a girl who we're not even sure will make it to 15. We can't tell you her name, because to do that would put her in a lot of danger. She says she got caught in Tampico, Mexico. This 13-year-old girl went more than 1,000 miles and was only a few hours from the U.S. The girl says the smuggler her family paid for left her alone on a bus. She fell asleep, got caught by Mexican immigration and was sent back to El Salvador. We ask her why she left. It is not a happy story. 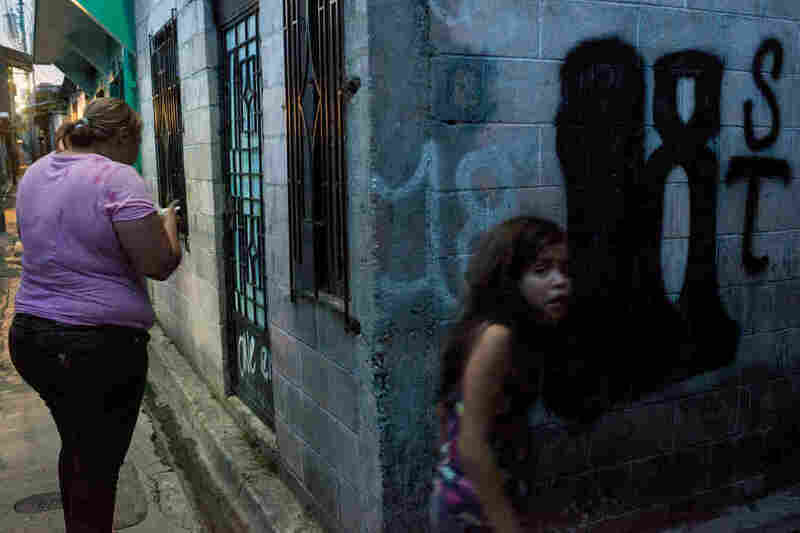 The girl says her father is in one of El Salvador's two main gangs. He's in prison for murder. And now he says if his ex-wife, the girl's mother, doesn't give him $50,000 when he gets out, he'll have the girl raped and killed. This is how gangs work in Central America. The girl says the family doesn't have $50,000. The girl's mom is in the U.S. Her grandmother works in a street stall. Her grandfather doesn't have a job. 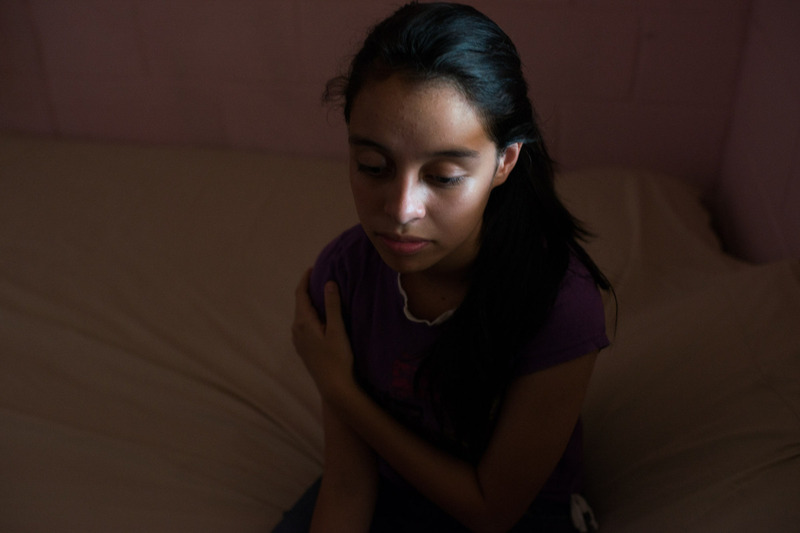 It's a Catch 22 — one that so many girls in El Salvador find themselves in. Mother and daughter hang around the streets of a residential area in San Salvador controlled by the gang Barrio 18. If this girl stays, she could be killed. But if she tries to go to the U.S. to claim asylum, she'll probably get caught again in Mexico. Or, worse. We know from people who study these migration routes, she could be robbed or kidnapped or raped along the way. "I don't want that to happen," she says. "I'm not one of those kids who waits till the last minute to make things right. I don't have to let these things happen to me." Pretty soon, it's time for the girl to go. Her grandpa is here to pick her up and take her home. We get her family's phone number and make plans to see her again. But we don't see her again.